Swim Jig Special- Split- The quicker tip is ideal for swim jigs. 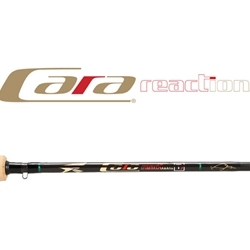 Deep Runner- Use this Cara for deep running crankbaits like DD-22s or Mann's 20 plus. Mike McClelland Heavy Cover Jig- BASS Elite Pro, Mike McClelland designed this rod for fishing football jigs in deep brush piles. It has plenty of back bone with a quick tip. Amistad XH- This rod loads up and casts medium size swimbaits. No more lobbing.